Ok, so I’m 10 days late to wish you all a happy new year. Sorry. I needed some time off after that last push to figure out how I wanted to approach this blog and my projects in 2012. It is not my intention to go on past the 50 crafts I’ve already completed or introduced. However, I do want to make sure that every undone project gets completed. I get a number of visitors from searches on particular techniques and I want everyone to have the opportunity to see a finished project. I do want to get this all finished, but I’m feeling a lot less time pressure to do it. Thank you all for your ongoing support. I had a fantastic year in 2011 and learned so many things, both about craft techniques and about myself. You were all a vital element in my successes (while I alone am to blame for my failures). Because the weekly goal format worked so well for me in 2011 I decided to start a new blog for my more mundane health goals in 2012. If you care to check that out you can find it at 2012 Week by Week. 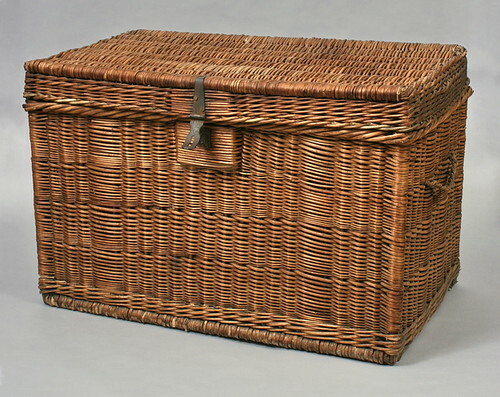 I have had a wicker trunk since I was young. It went back and forth to college with me (one time full of books, which was when I learned to pack books in smaller boxes). I still have it, though the top is a bit worse for wear. My vision for this trunk has been for it to have an upholstered top and function more like a bench. Now instead of just imagining it (like I have for at least a decade) I’m going to do it. Watch this space for updates! When we last left our dish it was designed and ready for its long nap in the kiln. 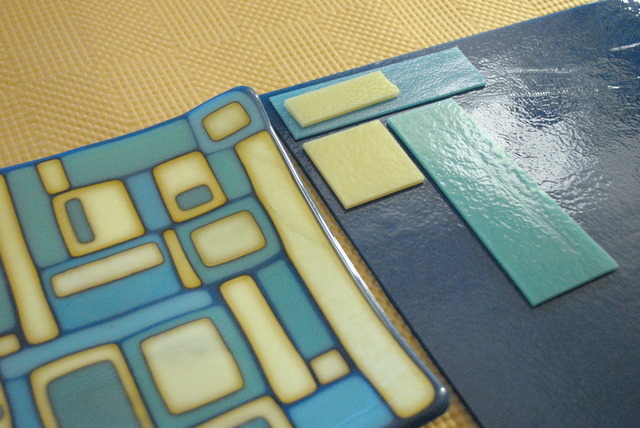 It takes half a day to fuse glass in the kiln, and then longer to shape and finish the piece. 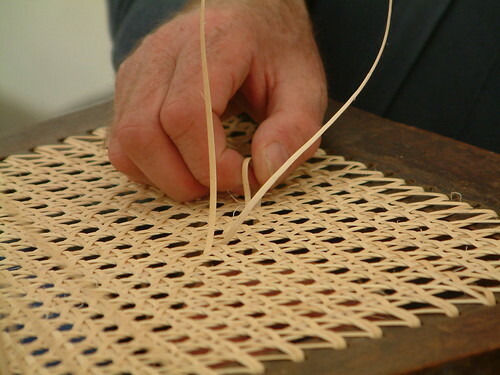 For the purposes of this blog entry we will be demonstrating using pieces that had already been finished. Here is the piece in the kiln. It is sitting on special kiln paper to protect the kiln floor. The kiln needs to heat the glass to 1500 degrees F for a full fuse, which is what we’re looking for. At that temperature the glass fully liquifies and becomes one piece. 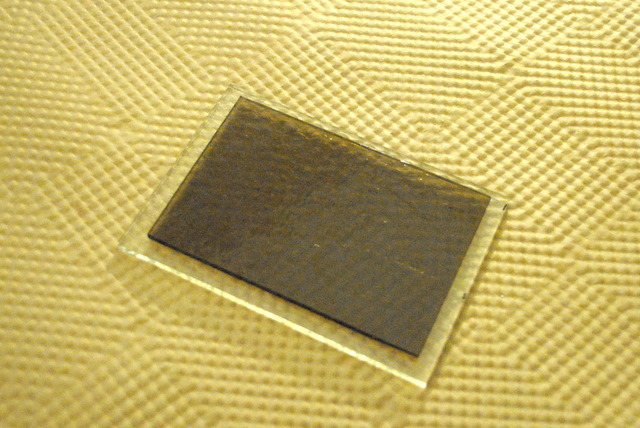 For technical details about fusing glass visit WarmGlass.com. 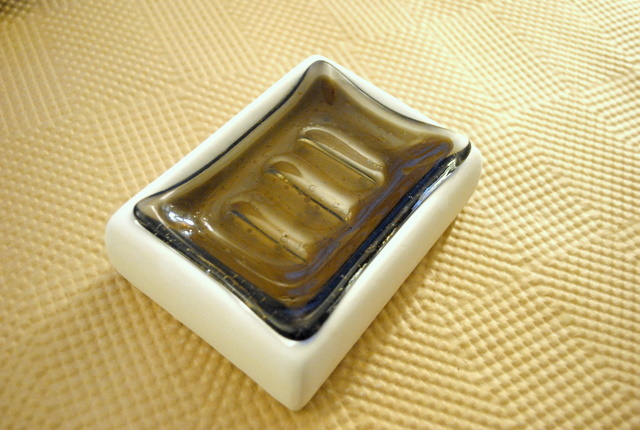 After the piece has fully fused and cooled enough to handle, it can then be shaped in a process called slumping. 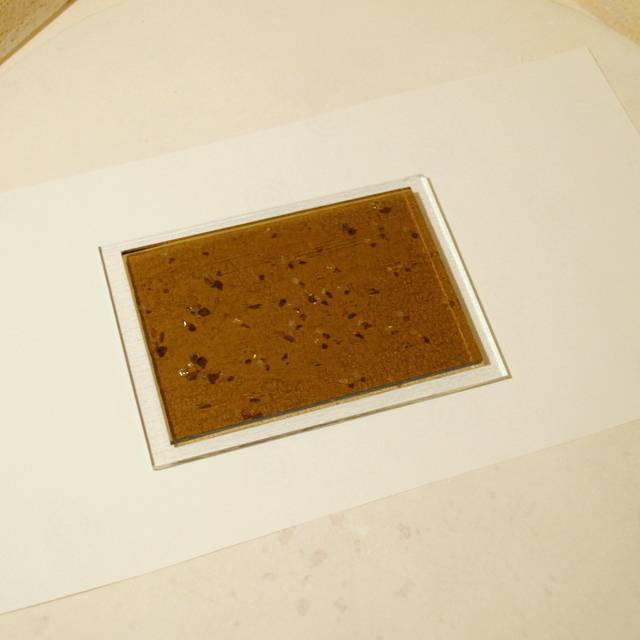 For this step you need a ceramic mold to give the glass its final shape. 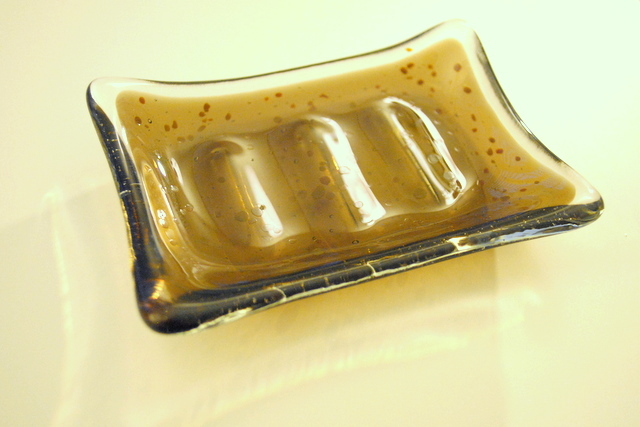 The kiln is heated again but not as hot — just until the glass becomes soft enough to take the shape of the mold. Check back tomorrow for a photo of our finished piece and my lessons learned. Just before Christmas I was invited to the studio of Melsie Glass to learn how she makes beautiful fused glass pieces like the one above. You can see more of her work at her Etsy store (or will be able to when she returns from her Christmas vacation). Before fusing glass one needs to buy some glass. Melsie Glass is made from a brand called Bullseye Glass. If you would like to try this yourself you can find it online or at a local glass shop. In the Triangle area of NC you can find it at Carolina Stained Glass in Durham. 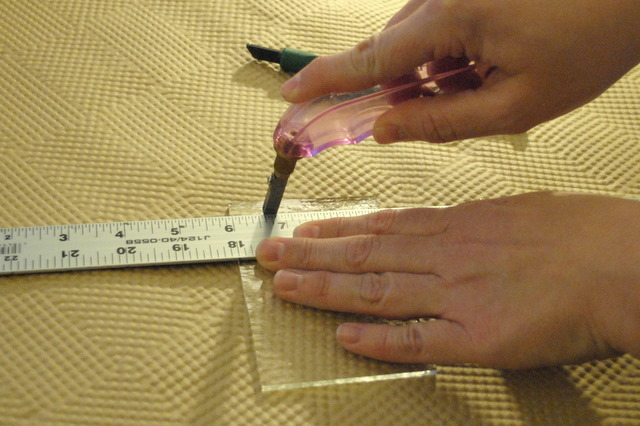 It is important to use the same kinds of glass when fusing to guarantee that they will expand and contract at similar rates to each other. The other supplies you need are glass cutting tools and access to a kiln. Notice how the clear is still visible around the edges? 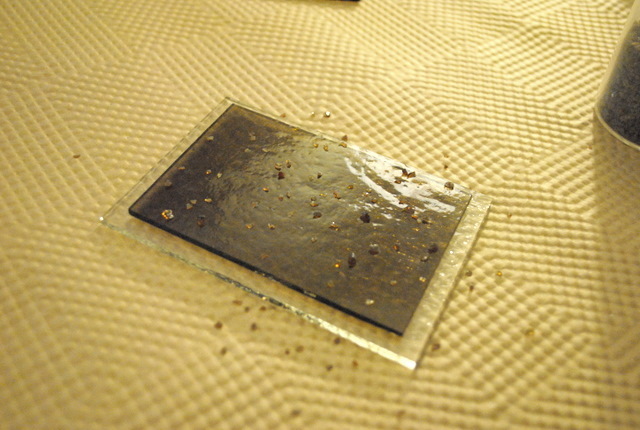 That will create a neat effect once the piece is fused. Then our dish was ready to go into the kiln.